Burton have just announced the addition of a new size safe to their popular Firesec 4/60 range. Previously only available in three sizes, the range will now feature a fourth larger model. 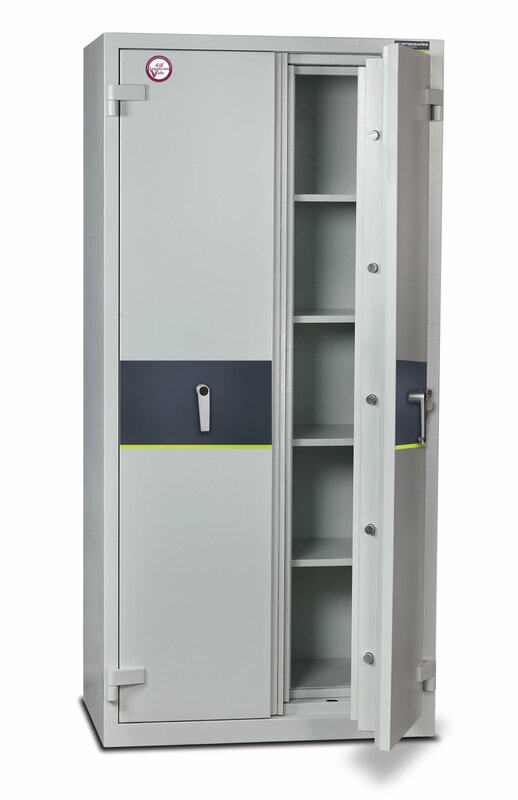 The Firesec 4/60 Size 4 is a large capacity safe with an impressive 535 litres of internal volume. Standing almost two metres high, it is ideal for storing and protecting a large amount of documents, binders and papers. Like the other models in the range, the Firesec 4/60 Size 4 comes with a 60 minute fire protection rating (to the LFS standard) as well as an EN 14450 S2 security certificate. This combination of fire and burglar resistance make the Firesec range ideal for both the home or office, where they can protect up to £4,000 in cash from two of the worst case scenarios. Certified by the ECB-S, the Burton Firesec range is AiS Approved and is also approved in accordance to Secured by Design specifications. Key and electronic locking models are available.